Below are several of the frequently asked questions about Mercy House. If you still have a question that was not addressed, please contact us for additional information. Mercy House provides a home and a supportive family to people with terminal illnesses who can no longer stay at home. Residents spend their final days surrounded by their loved ones, and the love of Mercy House staff and trained volunteers. How many people will Mercy House serve? Based on the number of beds and the duration of the average stay, Mercy house will serve over 160 residents per year when fully operational. Where does Mercy House fit in the healthcare system? Mercy House is a high quality alternative to costly hospitalization and nursing home care. Mercy House provides comfort and care when a cure is no longer possible. We focus specifically on comfort, dignity and pain control by responding to the needs and wishes of residents and their families. Hospice at Lourdes is the exclusive provider of Hospice services to the residents of Mercy House. Why is Mercy House preferable to other forms of care? Medical research consistently shows that hospice care improves quality of care, and in doing so reduces the need for emergency services and hospitalization. Studies of hospice care have also demonstrated improved family satisfaction and quality of life, decreased depression and anxiety, better bereavement adjustment, and improved survival among spouses. 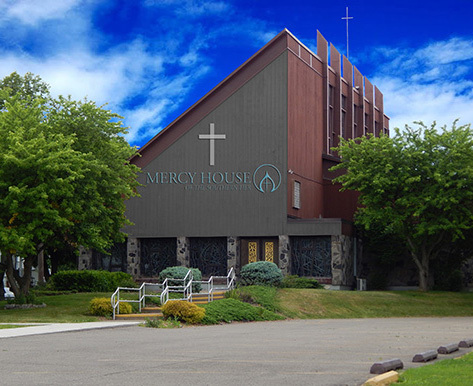 How is Mercy House unique from other programs in our area? Although most nursing homes designate a limited number of beds for hospice care, their staffing ratios do not allow for the one-on-one attention for any significant period of time and institutional environments do not offer Mercy House’s home-like setting. In addition, nursing homes are playing an increasingly greater role for people recuperating from hospital stays which creates a need for Mercy House. How has the community supported Mercy House? Community support has been overwhelming. Organizations and individuals have been remarkably generous. Personal contributions, memoriam contributions and our major fundraisers (the Mercy House Golf Tournament and our Gala of Taste) have given Mercy House a tremendous start to build on. Will residents at Mercy House be charged? Residents will be asked to contribute towards the cost of their care. However, no one is ever turned away because of lack of resources. Our funds raising efforts help to meet the cost of care for our residents. Why does the Community need Mercy House? The 2010 census shows that 44,485 people out of the 200,600 living in Broome County are of age 60 and above. Elderly make up a higher proportion of population in Broome County than they do in state and national population. Broome County: People age 60 and over comprise 22% of the population as opposed to 19% in NY State and 18% nationally. Mercy House of the Southern Tier will admit any individual with a life-limiting illness with a life expectancy of six months or less who has been admitted to The Hospice at Lourdes and has a signed Non-Hospital Order Not to Resuscitate (DNR Order). Residents are accepted without discrimination or any basis including: age, race, religion, color, national origin, veteran status, sexual orientation, marital status, gender, protected disability, or other protected group. How can I donate to Mercy House? There are several ways you can help Mercy House with its mission of care; Paypal donations, mailing a personal check or credit card.